Today is Killington's last day. I wanted to post this a while ago, but I've been overwhelmed lately. This was written a while ago, but only managed to select the pictures now. A return at Kmart after a 9-year absence. Longer for Lucky Luke. 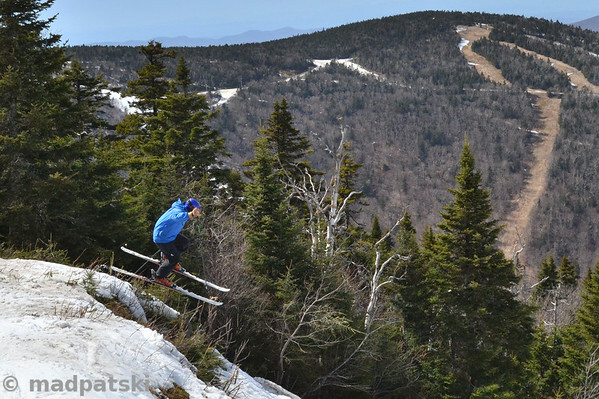 Patrick wrote: In hindsight, if we looked at quality/price/open terrain/distance (for us) analysis, Sugarloaf or Jay with each close to 40 open runs would have been a logical preferred choice. About 2 paragraphs into the report I as thinking that. You guys still managed 25K though. The title and use of the word “Deception” are not clear to me. 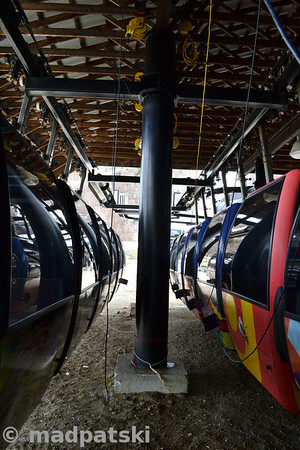 Did Killington’s website state that the K1 gondola or more than the 9 trails would be open? If so, you should have stated that explicitly (what they claimed would be open vs. what actually was open). If not, Killington wasn’t being deceptive, just cheap. And we all know Powdr Corp is cheap. It is puzzling, because if you knew in advance presumably you WOULD have gone to Jay or Sugarloaf. From what I read over the years, Sugarloaf seems to be the eastern area of choice in the late April timeframe. Perhaps you didn’t check in advance and relied on prior history at K plus general knowledge of how well the eastern spring was playing out this year. But the Killington website does list lifts and trails open, so easy to check. Tony Crocker wrote: The title and use of the word “Deception” are not clear to me. The French word déception means "disappointment" in English -- "Making The Most of Disappointment"? The title and use of the word “Deception” are not clear to me. 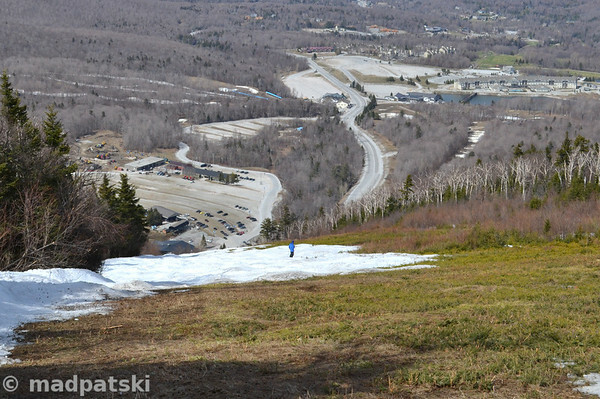 Did Killington’s website state that the K1 gondola or more than the 9 trails would be open? If so, you should have stated that explicitly (what they claimed would be open vs. what actually was open). Bingo!!! It is also a play on words with the English and French not meaning the same thing, but both applying. We were expecting K1 to be open. I believe during the weekend they had K1 and Canyon quad going for 30+ runs. The last I checked on the Kmart website on Monday morning they still approximately 30 runs open. I hadn't been to K with other terrain than Skye Peak open in the Spring in over 15 years and Lucky and I were looking forward to it. The fact that nothing was groomed in the morning also made it "interesting" to say the less. But we overcame that when we started "ducking" left and right. Tony Crocker wrote: It is puzzling, because if you knew in advance presumably you WOULD have gone to Jay or Sugarloaf. From what I read over the years, Sugarloaf seems to be the eastern area of choice in the late April timeframe. Perhaps you didn’t check in advance and relied on prior history at K plus general knowledge of how well the eastern spring was playing out this year. But the Killington website does list lifts and trails open, so easy to check. Yes, we were kicking ourselves, but you had a great day. We also had a liftutopia tickets at $33 which we're bought Sunday night when the evening report was out. I'm just happy we didn't spend $69 (I believe they actually charged $64 or $59 that day, not sure). I had a 2for1 coupon I would have used if I would have known. The best runs were definitely "not" open. The runs listed in our TR that we had hoped skiing (ie, Vertigo, Needle Eye, Panic Button, Ovation and Downdraft) were all skied. The last two pictures about were taken on Ovation...the previous two were heading toward and back from Vertigo. I neglected to notice that your ski day was a Monday. In the late season Mammoth often runs more lifts on the weekend than midweek. Thus it can be better to ski weekends. 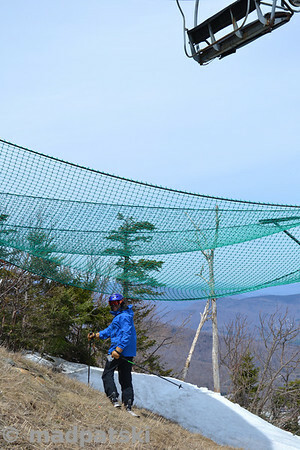 As lift operations are gradually curtailed in spring, Monday is the day of the week that cutbacks occur at most places. For example, Bachelor cut its hours back Monday April 21 and closed the west side of the mountain Monday May 12. Monday May 12 was also the day Snowbird stopped running at all Monday-Thursday. So in your situation I would definitely made an advance phone call to verify that lift operations would be the same Monday as the prior weekend. If not, you could have gone on the weekend to have more lifts/terrain or gone elsewhere if you had ski Monday. The Bachelor and Snowbird cutbacks were posted online well in advance. So thumbs down on Killington if they did not do that. Tony Crocker wrote: I neglected to notice that your ski day was a Monday. (...) As lift operations are gradually curtailed in spring, Monday is the day of the week that cutbacks occur at most places. For example, Bachelor cut its hours back Monday April 21 and closed the west side of the mountain Monday May 12. (...) So in your situation I would definitely made an advance phone call to verify that lift operations would be the same Monday as the prior weekend. If not, you could have gone on the weekend to have more lifts/terrain or gone elsewhere if you had ski Monday. 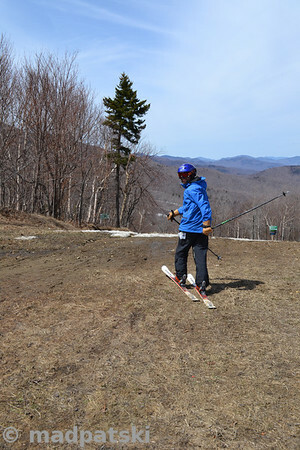 So thumbs down on Killington if they did not do that. Actually we skied on Tuesday, but found out that they were no longer running the K1 gondola that weekend. It ran the previous week. I remember skiing more open terrain on June 1, 1997 with the SS lift than what was actually open on April 29. I mentioned in my previous post, when I looked at the report, the run count was still at approximately 30. Phone call wouldn't have been useful as we left before people would be answering the phone. The fact that we had liftutopia tickets complicated matter (bought 24 hours before). I believe the weather was crappy that weekend and we had something I think plus they were charging $69. The most I paid this season was $44. So it sounds like you knew about which lifts would operate but were misled about which runs were open. I sympathize, as I planned the trip to Bachelor specifically for the last days both Summit and Northwest would run. You always take your chances with weather up there, but losing Northwest to mechanical failure on the day Summit was open was disappointing. I'm guessing Patrick has as little sympathy as I do for Powdr Corp's current cluster#$%& at Park City. Tony Crocker wrote: So it sounds like you knew about which lifts would operate but were misled about which runs were open. Actually we found out that morning. It still showed open on the condition page when I looked. And it was also open the previous midweek period, so that Sunday was the end of K1 for the season, regardless of snow coverage. Tony Crocker wrote: I'm guessing Patrick has as little sympathy as I do for Powdr Corp's current cluster#$%& at Park City. Killington pulled the plug (literally) on snowmaking because their electricity rate shot through the roof. They made 25% more snow than was in their initial budget but most of that was consumed resurfacing things after the many thaws. It wasn't a very good snow year and every time it got good, it thawed a day or two later. That doesn't make for great base depths so nothing outside of Superstar and Skyelark/Bittersweet where they did some early stockpiling had enough base depth to survive into May. They couldn't justify stockpiling Superstar to make June 1. Welcome to New England power shortages caused by converting to natural gas-fired generating plants when there is a big pipeline constraint getting natural gas to the region. When Vermont Yankee shuts down towards the end of this year, it's only going to get worse. - We have a very complicated rate structure that requires us on one side to scale back power use in times of grid stress and in return have supplemental power available on a daily basis above and beyond our fixed reserve and pricing to fuel the snowmaking engine. Market prices this year have been extreme. We price and purchase the supplemental power daily. - 50% of our air compression is electric in-house compressors while the other 50% is rented diesel. Diesel is the "booster" portion which helps us run full bore from October through January. From then on we run with in-house electrics. We are required to use latest technology with the diesel air so do not own our diesel compressors as the technology is changing by the year right now. Next year Tier 4 models require urea injection to the fuel systems so another 60-100K of added fuel expense. I should note that we are far below what we are allowed to emit from the diesels on the both the federal and state emission regulations which are very strict. - All resort, Pico and Killington power use is monitored in-house from 5 major meter points in 15 minute intervals year round to stay in contract compliance or huge fines result. We work closely with the utility company to schedule daily power use and to scale back due to local issues typically between 5-8pm during very cold periods and high energy use. We also contract with New England grid providers to scale back in times of grid emergencies like a major power generator being down and are subject to real-time tests on our ability to scale back.